My favourite self-made item: Fifi Lapin print raincoat. Every time I look at it, it makes me smile. I wear it regularly on long walks with Jessie, regardless whether it’s raining or not..
My most popular post was: In The Mood For Love: 21 dresses. Quite a surprise, as it’s a random post that has nothing to do with my makes. According to WordPress it was shared on Facebook 1K+ times! Maybe I should start writing about my favourite movies instead? :) Although I’m not surprised that people are more interested in looking at Wong Kar-wai costumes rather than my modest creations.. The second popular post: Poncho from Scarf. According to my stats, every single day there are people somewhere typing in their google search “how to make a poncho out of scarf” or something like that.. Who would’ve thought? Funny thing, statistics.. Apparently, I had visitors from 102 countries, including countries that I didn’t even know they existed..
And now, as promised, a giveaway! I am giving away a Burda style magazine 9/2013. This issue has patterns that you either love or hate, but it is certainly not boring! 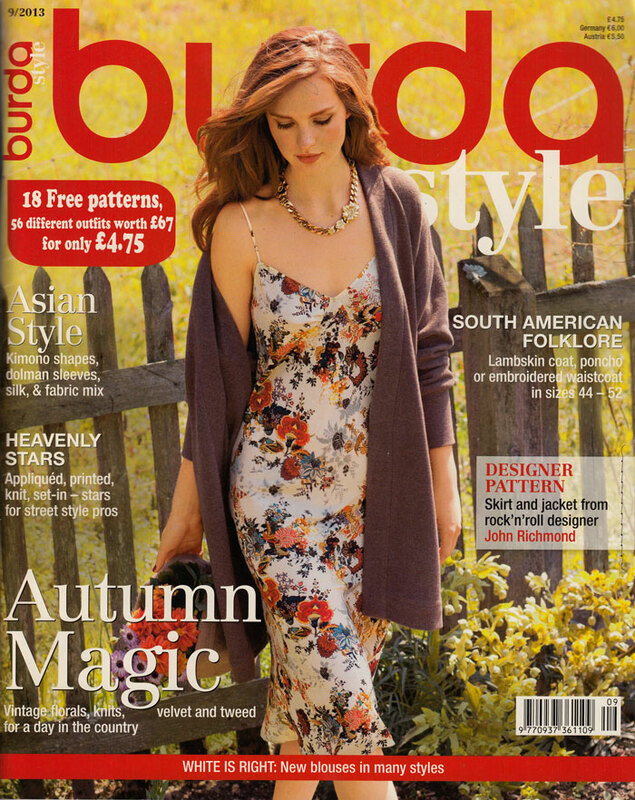 If you want to know what is up for grabs exactly, go and see a Burda Style September 2013 review by ooobop! Now, I traced (very accurately) a couple of patterns from this magazine, but the pattern sheets are in pristine conditions! Giveaway is open internationally till Sun, 1st December, and all you have to do is to comment on this post. Easy! PS. Giveaway is closed. Congratulations to Tracy who won it! Happy Blogiversary my sewing blogger friend!! A big accomplishment. AND, your Fifi Lapin raincoat is TOO cute!! I had not seen it before, love it! Happy blog anniversary! what a fun recap! I am a fan of the In the Mood for love post and that was how I came across your blog the first time:) Your raincoat is really cute!! The fabric is perfect for it. Congratulations on your anniversary! It is a pity that google searches now result in “unknown search terms”, it is sometimes so funny to see which searches landed people on your blog. Congrats on your first year in blog land, would love a copy of Burda Style Mag, very hard to get in Australia, have never seen a copy. Hello, happy blogday! I’m a new sewer and am also thinking I should start at least blogging about my experiments (since I don’t dare to wear them out yet, haha). But I like it, it’s addictive, sewing takes all of you in: there’s mathematics, there’s geometry, there’s touch, sight, color, texture, even the smell of new fabric :) Blogs like this are motivating and instructive for me, so thank you! Happy anniversary. I am a new novice sewer and I love blogs to give me inspiration and ideas. Congratulations on your blogging anniversary! It’s funny, the random posts that prove popular. My most popular post by far is one where I made a Slender Man mask for my son to wear to a Halloween party… it’s had 90,000 views and still gets about 70 each week. Amazing!! Sorry I missed your first blog birthday (that was my manically busy week). I don’t think there’s any harm in blogging whenever inspired and on any topic! Really love your raincoat too.